Millennials are the largest population in the workforce and Gen Z is not far behind. These career driven, entrepreneurial, socially responsible technology natives are revolutionizing the workplace. Employers are breaking down their organizational silos to embrace collaboration, exchanging hierarchal structures for matrixed structures, and shifting the learning paradigm from training to organizational development in hopes of engaging these workers. It is a completely different ballgame out there and unfortunately many millennials are working for leaders who are still calling plays from an outdated playbook. Today the game is packed with players who view their careers differently than their predecessors. Innovative practices that differentiated great companies in the past, such as defining company culture and adopting company values, are now table stakes for the new generation of employees. They value company culture more than any other generation that has come before them. Their values run deep, impacting more than their work. This generation, coined the “giving generation”, are not only looking for ways they can grow and develop their skills at work, but seek out ways to make an impact in their communities as well. They have high expectations of the individuals they choose to work for. They presume their leaders’ actions and behaviors align to company values on a daily basis. When leaders try to engage this group with outdated playbooks, they end up stymieing the contributions of this new generation and will driving them away. Coaching leaders who need to come to terms with the fact they were taught to lead and manage in a way that no longer works in today’s workplace, is a challenge. They have spent their entire careers being rewarded with accolades and promotions for exhibiting the very behaviors they now need to change. Most leaders are unaware when their playbooks become outdated and they continue to call plays not realizing they are chasing away their talent. Employees have plenty of options in this labor market that is near full employment and has a record number of job openings. In fact, Americans are quitting their jobs at alarming rates. More than one of every four workers has a high risk of leaving their current employer and in the month of July 2018, 3.5 million Americans quit their jobs. 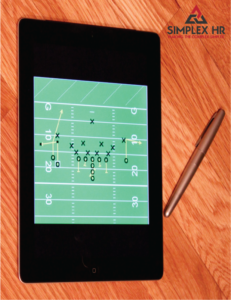 So how do leaders update their playbooks to engage their teams? Start by eliminating these 5 outdated plays from the playbook. When you are left to sink or swim, you are left on your own, without any help, and you have no choice but to fail or succeed. While this may be a good play for someone who has fallen into the water, it is not a play that engages Millennials. Many leaders today worked during a time when employees received nothing more than an employee handbook outlining the rules when they entered the workforce. If they received training it was nominal and they “learned the ropes” along the way. Those who “made it” did so because they “swam” figuring out on their own what it took to move into the higher level jobs they have today. This was the way of the world and the “Sink or Swim” play was accepted and expected. Fast forward 30+ years and we find people coming into their first job more skilled and educated than their predecessors. These employees are eager to learn, having grown up with access to devices and information that fueled their intellectual curiosity. They will put forth discretionary effort, contribute innovative ideas, and secure the future of your organization in exchange for coaching, mentoring, and development opportunities. Today it is best to leave the Sink or Swim Play for the water and spend your time developing and growing your people. Leaders think they are doing the right thing by shielding their employees from “distractions” or “noise in the system”. They put forth tremendous effort to spin or neutralize their communications with employees, emphasizing only the key points they want people to hear. I have watched leaders spend hours carefully crafting employee communications, omitting or deemphasizing information that could be perceived negatively, when they should have taken more time to prioritize transparency. Millennials have shifted consumer behavior drastically. Companies have figured out ways to provide more information online and in stores about their products to gain the loyalty of the Millennial consumer. Millennials have high levels of interest in what they eat, what they support, and what they buy. They value transparency and will be loyal to a brand who can provide this, even if it costs more. If Millennials are putting this much emphasis on transparency in their consumerism, why are leaders not making the connection that they will desire the same level of transparency in their careers? These employees will not be satisfied with blindly following orders. They are truth seekers and want to understand if and how their efforts are making a difference. Leaders need to leave the sugar in the kitchen and concentrate on the ingredients that create a supportive and transparent workplace if they want to keep their future talent. We all remember that one person who would spout off stories about how hard they had it when they were our age. Their story involved elements of walking uphill barefoot in the snow. All kidding aside, there are some leaders who believe employees need to “pay their dues” in order to achieve access to information. They host exclusive, closed door meetings titled with an acronym that are attended by a privileged few. During these meetings, information is shared, and decisions are made by people who are typically the furthest removed from the topic at hand. The people who are privy to that information have been carefully selected, having “earned the right” to obtain it. Instead of embracing employees’ backgrounds, knowledge, and perspective, leaders end up creating an environment of exclusion. This generation of Millennial workers value collaboration and inclusion and they wish to contribute by sharing feedback, ideas, and opinions. Leaders need to find ways to encourage participation in critical discussions and “demystify” the traditional closed door, invitation only meetings with lavish names. Dues are for clubs, and these employees count on leaders having a seat for everyone at their table. Millennials do not define success in tangible forms. Don’t get me wrong, a job title, fancy car, big house, or a six figure salary are great, however a Deloitte study done in 2016 revealed the Millennials defined success by things like work-life balance, workplace flexibility, and control over when and how they do their work. This doesn’t mesh well with the “if I can’t see you, I don’t believe you” mindset. Many leaders were taught management principles in an environment where performance was measured through output and hours worked. While productivity is critical, intangible success factors are also crucial components to performance. Competencies such as communication, relationship building, collaboration, thought leadership, and conflict management can be accomplished successfully in a virtual environment. All it takes is technology, the willingness to trust people, and the flexibility to allow work outside of the traditional 8am-5pm workday. Leaders no longer need to control or direct tasks, but they do need to trust, empower, and lead. Micromanagement is the top complaint employees have about their boss. Employees want leaders who motivate and empower them to do their best work. If they don’t have that in their current role, they will find it somewhere else. Leaders who retire the “See It to Believe It” play and call plays that encourage flexibility and work-life balance will end up scoring every time. Many employees join a company with so much excitement and enthusiasm. They show up on their first day, attend an orientation, and are handed an employee handbook that communicates what life is like as an employee of that company. That balloon of energy slowly deflates when they see the handbook has more pages than the Odyssey. Yet, they put forth 110% and read through the policies one by one. Their balloons deflate a little bit more when they read about the complicated multi-step progressive discipline process they will succumb to if they make a mistake. A little more air continues to escape as they are told the number of minutes they can be late before it counts as an official tardy. Then, they read the exhaustive list of unacceptable behaviors (many of which are common sense) and the examples (and illustrations) of appropriate wardrobes. What little energy they had left in their balloon is gone. This is the first experience many employees have with their employer, which is not exactly motivating or engaging. As an HR Professional I believe employee handbooks serve a purpose and are necessary, however most leaders design policies for 2 very small audiences. The first audience are the employees who put forth tremendous amounts of effort to find loopholes and circumvent the system, which leads to prescriptive and restrictive policies. The second audience are the managers who are uncomfortable providing feedback or addressing a behavior unless there is a specific policy they can cite, which leads to the complex, bizarre examples and scenarios that end up making their way into a policy. Designing for the exception results in policies that hamper employees, causing unintended consequences. They also allow leaders to hide behind policies and point out mistakes instead of having conversations on what it takes to be successful. Leaders need to stop hiding behind handbooks, policies, and procedures and grant people the flexibility and discretion to use them as they were intended, a general guide or map to steer their decisions and behaviors. If you have any of these plays in your playbook, it’s not too late! Understanding the generations of employees coming into the workforce are completely different than those of the past, is the first step in evaluating your playbook. Companies figured out they needed to overhaul how they marketed to and served this group of consumers in order to stay relevant. It only makes sense that companies need to extend that philosophy to their leadership. Every generation has a reputation and Millennials tend to be described negatively using words like entitled, narcissistic, and disloyal. Yes, Millennials do have high expectations and prioritize their needs, but they are also open-minded, connected, ambitious, technologically savvy, and are expert multi-taskers who are making significant impacts in the organizations with leaders who have figured out how to call plays that tap into their potential. Now is the time ditch the outdated plays in in your playbook and get ready to play ball! Shannon Stickney is a Life and Executive Coach and Founder of Simplex HR, an HR consulting firm that provides HR and leadership training to businesses and groups. Contact Shannon today for more information on leadership training or to book a speaking engagement.